I would like to announce the news of a Free Public Seed Bank in the City of Darebin, initiated and run by the community and supported by local government and local businesses! Back in 2014, as part of the Darebin Leaders in Sustainability course (an initiative run by local government), Kerrie Ludekens and Angelo Eliades (me!) began a project to establish a free local seed bank. Kerrie initiated the project and invited me to come on board as a project partner. A local government grant of $500 was provided through the Darebin Community Support Program which helped fund the project. Why a Free Seed Bank? 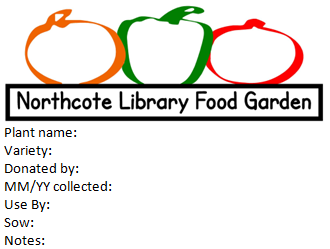 My project is to establish a seed bank (seed library) for the Northcote Library Food Garden (NLFG). Seeds are collected, catalogued & stored in a central location. The seeds are available for NLFG, other community gardens/projects plus the Darebin public. A major purpose of the seed bank is to both grow seedlings for the NLFG community garden, and also to grow seedlings to sell to the community so the project will become self-funding in the future. As you can see from Kerrie’s explanation, a free seed bank offers many benefits and is a valuable addition to the community. 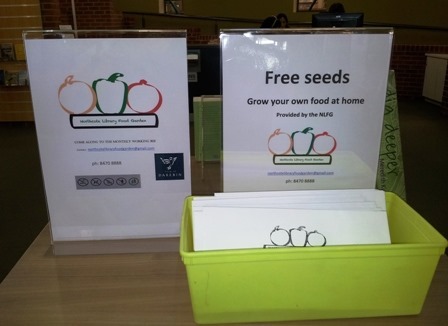 Free seeds from the Northcote Library Food Garden (NLFG)! Northcote Library Food Garden (NLFG) at their working bees – Working bees: Second Sunday of the month 10am, except long weekends. Also, the Northcote Library Food Garden (NLFG) are looking for more members to share the experience of growing and sharing healthy organic food together. The NLFG is next door to the Northcote Library at 32 – 38 Separation Street. 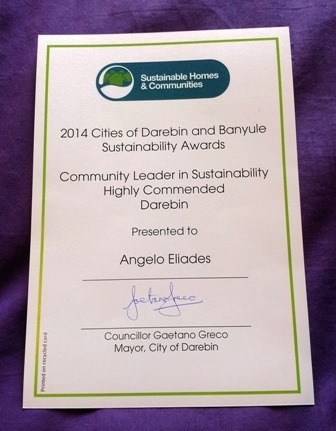 Both Kerrie and I were awarded the Darebin Leaders in Sustainability ‘Highly Commended’ award (runner-up award) as part of the Darebin and Banyule Sustainability Awards in 2014 for our work on this project. It was great to get both support and recognition from local government for a project that will benefit the community and promote sustainable living! When thinking through how we would run a seed bank that was free to the public, we had to design a system that was easy to manage and very time efficient. The central idea which drove the project design were the seed envelopes. It was important to capture all necessary information on the seed envelopes without making them too cluttered or hard to read. Notes: Any additional notes that may be required. This information was used to produce a design for the envelopes, shown below. 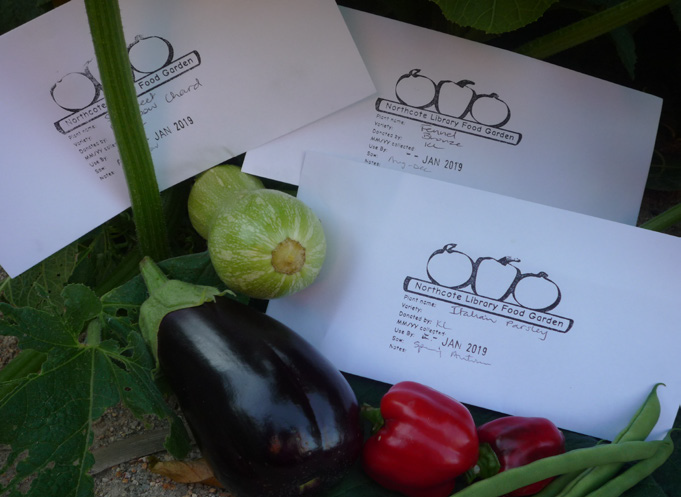 The design was taken to a company that makes stamps and we had a stamp made up (single colour) so we can stamp blank envelopes quickly and easily for seed storage and distribution. One of the most important issues for a seed bank is that the seed is fresh and viable, in other words, the seeds if sown will germinate and grow into healthy plants. Seeds need to be kept in a cool dry place for maximum storage life. If you’re handling a large number of varieties of seeds then you’ll also need some means of organising them. We used a recycled filing cabinet with suspension files to hold the seed enveloped (in alphabetical order of course) and provide a cool, dry storage location. The problem with seeds is that they can’t be stored indefinitely, different seeds can be kept for different periods of time. Using this system, we can look at the ‘MM/YY collected’ date on the envelope, look up the plant in the Seed Storage List and then work out the ‘Use By’ date, which will eithe be 1 year, 3 years or 5 years after the collection date. With any project it’s important to regularly review its progress to ensure it’s on track and achieving its intended outcomes. When speaking the the people at one of the seed collection points (where members of the public can collect their free seeds), Northcote Library in this case, I was advised by the staff that the project was a great success and they could barely keep up with the supply of free seeds to the public. From the early stages it appears that the Northcote Library Food Garden (NLFG) Free Seed Bank is being very well received by the community, and why wouldn’t it be, who would turn down free seeds and miss the opportunity to grow their own vegies and herbs at home! This entry was posted in What's New! and tagged City of Darebin, free public seed bank project, NLFG, Northcote Library Food Garden, seed bank. Bookmark the permalink. 1 if the seed is great you know the source and 2 wil detour Monsanto from planting dirty tricks.